Alcoholism is the most prevalent harmful substance in almost all over the world and in fact, in the United States each year millions of people suffered from alcoholism. It is considered as a medical condition that can be diagnosed by screening and treated when a person’s drinking causes distress or harm to himself or to others. It is necessary to create awareness on the National Alcohol Screening Day to stop drinking behaviors with silicone wristbands customized at amazingwristbands.com – a leading provider of custom silicone products. There is no doubt that excessive consumption of alcohol not only affects the total body thus by causing several types of cancer, but also leads to depression, anxiety, loneliness, neglected by society, violent behavior, vehicle accidents, suicide attempts, and even domestic violence. In addition, this behavior can affect the entire family and their loved ones, especially their children. If you really want to live a healthy and alcohol-free life, conduct an alcohol screening and if needed take further treatment. It is a test to determine the presence of alcohol, the quantity of intake, drinking behaviors, and alcohol-related health issues. If the result is negative, then require treatment. A specific National Alcohol Screening Day is observed each year on the Thursday of the entire first week in April. The purpose of this day is mainly to increase awareness among the public that alcohol abuse and alcoholism can be cured by screening and treatment. Also to raise awareness of the various health complications that one can face due to drinking behaviors, including depression, aggression, heart problems, irregular control of sugar and blood pressure and sexual problems. Alcoholism affects millions of people throughout the United States. Though some are thriving for recovery, many are still not aware of the seriousness. Increasing awareness about alcohol disorders is important that people of all generations recognize the dangers of drinking and how it affects the body and mind. There are many ways you can do this – just share your knowledge with your friends, family, colleagues, to make small changes, like keeping track of their drinking and setting limits. You can be a source of support for someone struggling with addiction. Conduct an alcohol screening in your workplace which is a necessary step for the growth of a company as alcohol behavior affects the quality of work of employees and can brutally damage the atmosphere and reputation of an establishment. No awareness campaign in your area? On this National Alcohol Screening Day, organize one to spread the word about the negative impacts of drinking, how it affects our life, mind, health, finances, and moreover personal relationships. Invite local media and healthcare professionals and arrange for a seminar on alcohol screening and let the public know that high-quality treatment to stop drinking behavior is available to those who need it. Even though there are many different ways you can promote health and well-being to people, using customized silicone wristbands is one of the best ways to effectively convey your message in view of the easily customizable nature these products have. They are simple and ideal one for everyday wear, and also easily available online in various colors, fonts, sizes and styles such as debossed, ink filled debossed, embossed, color-filled emboss, and screen printed. 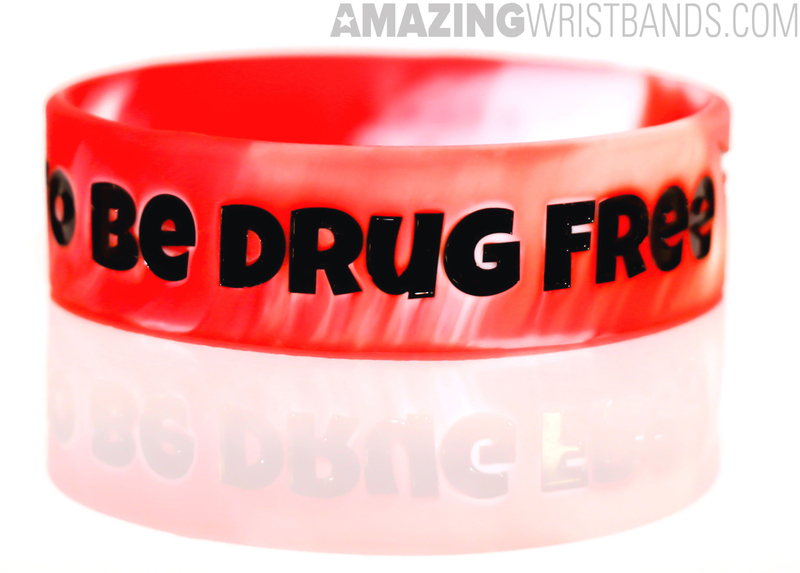 In addition to standard size wristbands, you will also find thin, wide, extra wide, slap bands, adjustable bands, LED wristbands and USB flash drive bracelets. No doubt, here you will get the products made up of good quality silicone material that are 100% latex-free, comfortable and do not cause irritation. They are durable and long-lasting. Moreover, you get our products at very affordable prices and also for bulk purchases, you will get attractive discounts. So many colors and color combinations to choose from.